From the moment that Celine Dion’s songs became popular she started performing them in her cover bands, she and others immediately began to recognize the similarity in their voices. No matter where she was performing, when she performed a Celine song, people would stop in their tracks to hear her finish the song and would often come up and hand her money after the song. “It just made people want to tip me, which is fine with me.” She jokes. She also states that her natural voice sounded like Celines before she had ever even heard of the fabulous Celine Dion. When you experience her perform her “Tribute to Celine” show, from the onset of the first beat of the music, She enters the stage with a passion and fervor like no other performer. With a magnetic stage presence and gorgeous custom made costumes, She sails her way through an exciting set of Celine’s greatest hits playing to the audience as only Celine seems to be able to do. She absolutely sings from her heart putting herself out there baring her soul for all to see. When you experience her sing with such power, you often wonder how she accomplishes such range. She hits the high notes with the same Power that Celine does leaving many to wonder if she is actually lip- synching. Singing the songs with natural ease, she gets the crowds pumping with “Love Can Move Mountains”, “I’m alive” and dances around the audience to “River Deep, Mountain High”. Inevitably, there is not a dry eye in the house as she powerfully holds that last long high note of “The Power of Love” and breathlessly ends the final phrase of “My heart will go on”. What to expect from the “Tribute to Celine show?” As miss Celine Dion, singing and performing in her unique poses and positions, executing Celine’s facial expressions and the way she speaks with her French Accent, wearing her replicated costumes and of course the icing on the cake, the almost identical singing voice . 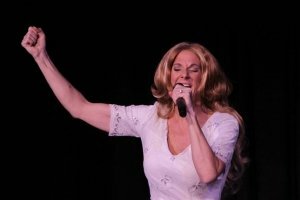 She has recently been hailed as the premiere Celine sound-alike of the United States. Her rapport with the audience is natural and comedic featuring original monologues every time. Her eye to eye contact with the audience has every person feeling like she is singing only to them and makes them feel connected and very much a part of the show. It is not unusual to see a few people crying, who are just experiencing an overwhelming emotion.